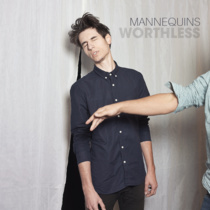 French based Mannequins released their album ‘Worthless’ in November 2014. Although formed in Rouen, the band also has links in the UK and this is reflected in their style of music, which has an indie sound to it reminiscent of when it was a major part of British culture back in the 90’s. Describing themselves as “Halfway between the dying ghost of Shoegazing and the sticky residue of a Glasgow Saturday Night Fever, five-piece french band Mannequins lay their cards on the table”, and this gives a good indication of their influences that can be heard on the album. The album plays through at a relentless pace, with many of the tracks having a rock sound but also with indie and slight punk undertones. This can be heard on tracks such as ‘Hang Up Calls’ with its catchy hooks, ‘Dawns’ that has a thumping drum intro, and ‘Shaking Hands With The Devil’, which is full of infectious sounding guitars that form an excellent contrast over the darker sounding vocals. ‘Clocks’ has a slightly heavier tone, with delicious sounding riffs that have more of a rock element to them, along with great sounding harmonies on the track. ‘Until The Moon Comes Down’ shows a softer side to the band as more delicate guitars play behind atmospheric sounding vocals. The final track of the album ‘Red Corvette’ has more of that fast-paced beat, making this a collection of excellent sounding tracks. Although slightly short in length with it being just under 30 minutes, all 9 tracks on the album are massive sounding songs.